I came home from out of town to find hundreds of termites in my tub, they had eaten a little hole in the sheetrock and came out from there. I walked around my slab foundation and do not see any tubes or tunnels. How do I treat this? I was thinking to trench around the foundation with Termidor and then spray something on the beams in the attic. Looking for advice. You are correct, trenching and treating the exterior perimeter of the home with Termidor SC is part 1 of the process. Use an application rate of 4 gallons of Termidor mix (it comes concentrated, mix with water) per 10 linear feet of trench. 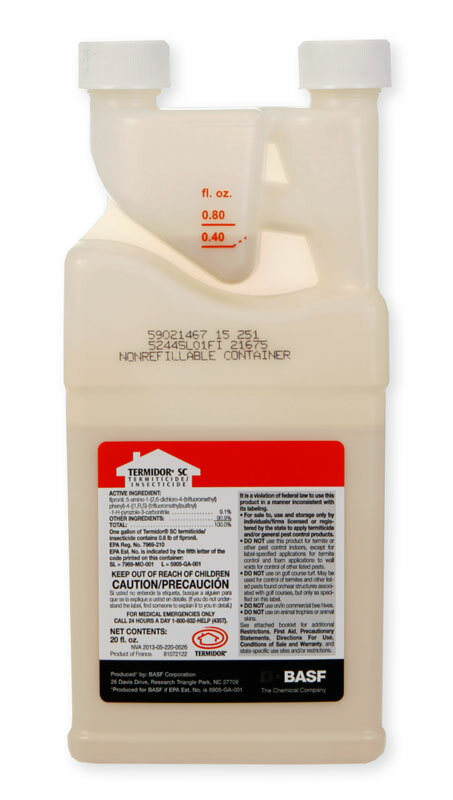 An average 200 linear foot home (exterior) requires around 80 gallons of Termidor mix. Indoors, use Termidor foam and foam the plumbing void where the water lines are located. Do this by using making a small hole aboutu 6 inches off the floor and in between all wall studs where water lines and drains are located. Make a 20-30 second injection of Termidor foam for each wall void. The bath tub probably has a trap or cut-out under it. This trap is basically a 1 foot square section of dirt where the drain goes through the foundation. Cut an access behind or beside the tub about 6" x 6" through the sheetrock. Get a good flashlight and look under the tub and inspect the trap for termite shelter tubes that are emerging through it. If you see any, use a screwdriver or something and knock them down. Then apply about 2 gallons of Termidor mix into the trap thoroughly saturating it. If the A/C plenum draws air from the bathtub area, don't use Termidor, Use Altriset. When finished, replace the sheetrock in the wall, use a small amount of ducttape to hold the sheetrock in place, and then install an A/C Vent cover over the hole to cover it. This gives future access and also makes the hole look nice, like an A/C Vent. You can get a nice looking cover at any hardware store.